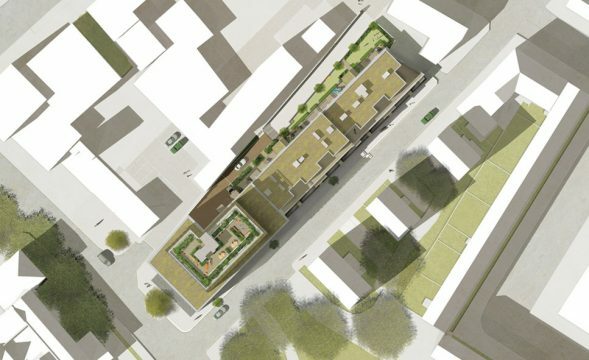 We were appointed by a developer client as landscape architects on this 0.23 ha brownfield site. We initially reviewed the Planning approved information and developed a landscape design to the satisfaction of our client. We then prepared a package of landscape architect ‘s information to satisfy Conditions. Once Conditions were approved our landscape architects prepared full Tender and Construction packages of landscape information. The monitoring of on site works and signing off the landscape works at completion was included within our scope of services. The plot is linear in nature, measuring approximately 95m by 24m. The existing site levels are more or less flat. Just to the south of the development an existing mature TPO tree is located within the public footway. To the north west boundary various Party Wall agreements were required. Vehicular access to this development is via a shared carriageway to its rear. 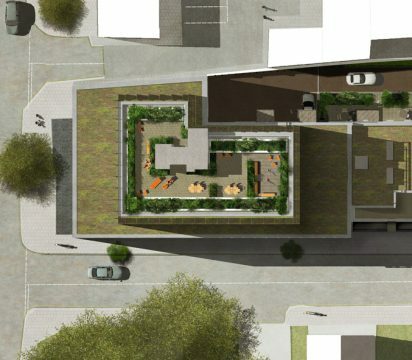 The main areas of our landscape design input was at ground floor and at the seventh floor communal roof garden; at the south end of the building. 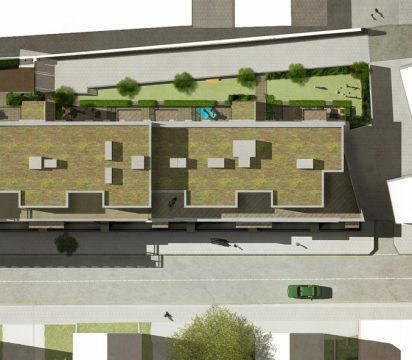 To the rear of the development at ground floor level our landscape architects needed to provide private amenity space, share amenity space (with informal under 5’s play and planting), parking for four cars, sub station access and a secure boundary line. 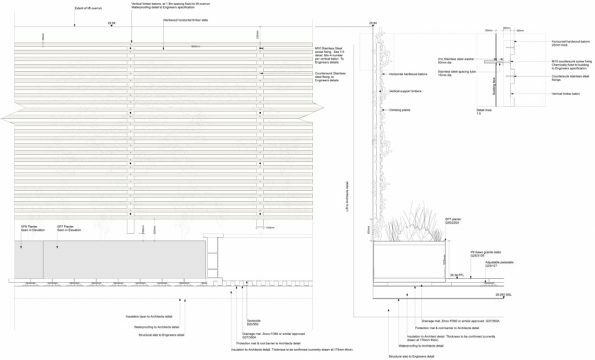 A below ground attenuation tank within the parking area needed to be coordinated and accommodated with our proposals. At the ground floor frontage we needed to accommodate bridged access (over the lower ground floor patios) to the four communal entrances and a suitable entrance space to the ground floor office space at the south end of this development. The seventh floor roof garden has been designed as a series of interlinked rooms; defined through contrasting paving and the careful positioning of planters and furniture. This allows multiple resident groups to frequent the terrace at the same time whilst providing a sense of privacy for each. Our landscape architect’s specification included purpose built planters to the perimeter of the terrace to provide shelter and a beautiful landscape edge, whilst accommodating long distance views.